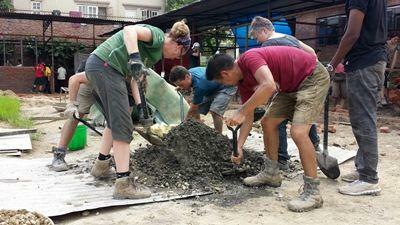 It has been one year since volunteers on our Disaster Relief project in Nepal began rebuilding schools in the Kathmandu valley. The earthquake that struck the country in April 2015 – and the subsequent aftershocks – left many schools flattened and many children without a safe space to learn. With educational resources lost to the rubble and a nation left reeling, the education of Nepal’s children came to a standstill. 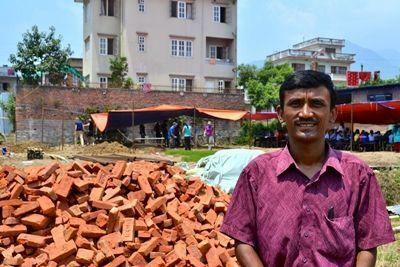 Just 24 hours after the quake, Projects Abroad established a Disaster Relief project to help rebuild schools in the Kathmandu area, and volunteers started signing up to help with relief efforts. Barely one month later, the first group of volunteers began digging the foundations for Sunrise School, the first of six schools rebuilt by volunteers over the past year. The six schools have been built with the help of construction engineers, architects, local staff and over 450 volunteers. Assembled from the ground up and with a total of 65 classrooms, the construction of these schools has enabled over 1500 students to continue their education and over 60 teachers to return to work. Following the tremors, many children were scared to make use of regular buildings for fear of them collapsing. With this in mind, staff and volunteers on the project prioritised safety above all and built each school from earthquake-resistant, flexible structures and light zinc sheet roofs. They painted the walls with bright colours and added vibrant wall decorations to encourage a creative and playful space, where the children would feel secure and happy. Though there is still much work to be done in Nepal, with the continued work of our dedicated staff and volunteers, we are confident that we can further our impact in schools and communities across the country. See how you can contribute to our Disaster Relief work in Nepal and help the country get back on its feet.